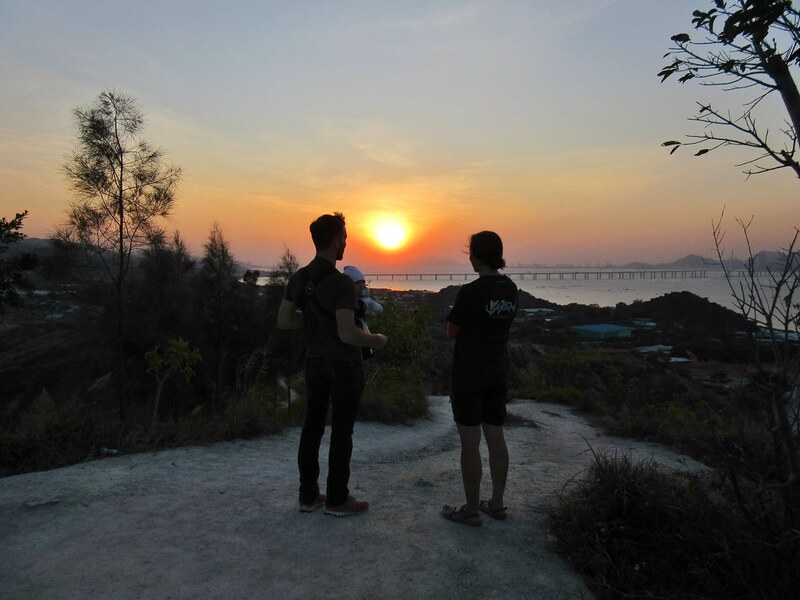 We were up early, ready for a long day, with over 110km planned from Suichan to continue our mission of getting to Hong Kong by the weekend. Our hotel room didn’t have a window (often the cheap rooms don’t) so we only saw what the weather was doing once we got outside. It was raining heavily, yet another wet day. Then, wheeling our bikes out of the hotel, we noticed that both of our rear tyres were very soft. They must’ve picked up punctures riding through the muddy rough road on the way into town the previous afternoon. So we changed the tubes, sheltering from the rain in the porch of the hotel trying and failing not to get too dirty from all the mud on our tyres and wheels. Great start. 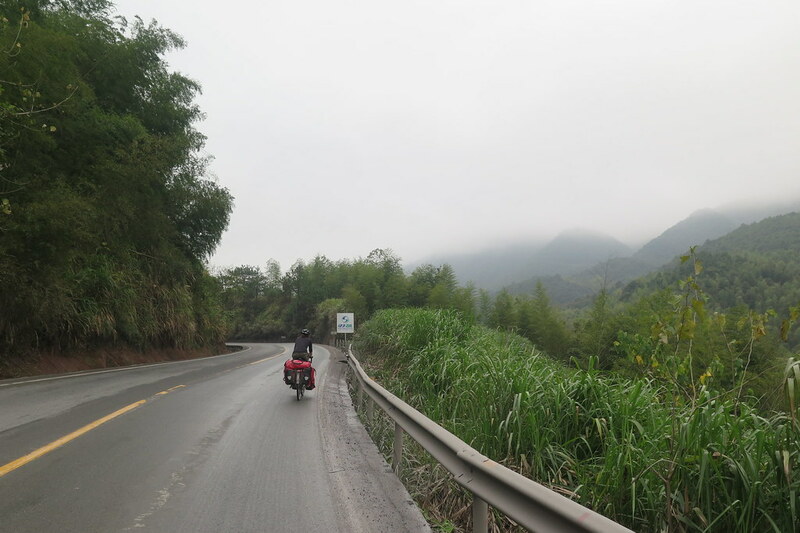 Then we rode out into the pouring rain, having wasted the first hour of the day! We were straight into the hills going south on G105. 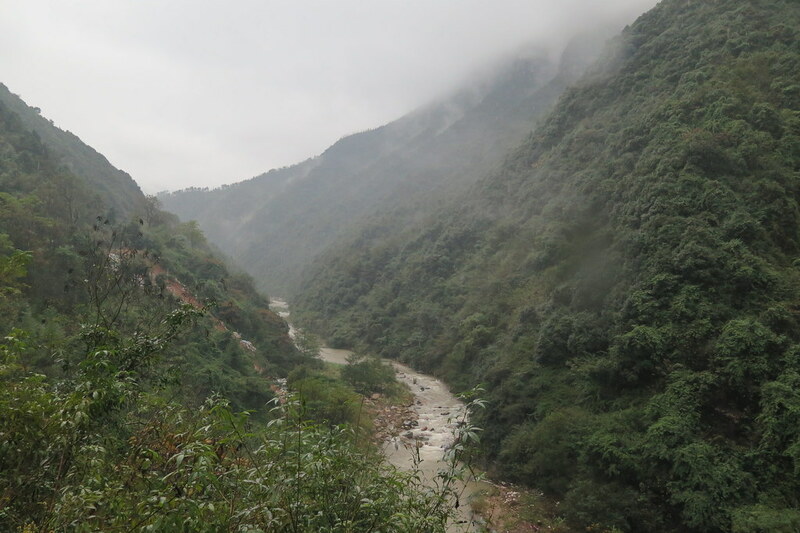 The scenery was starting to get really good beside the road, even with the low clouds and heavy rain. Unfortunately we didn’t take too many photos as I didn’t want to open up my handlebar bag and get the contents and my camera wet. 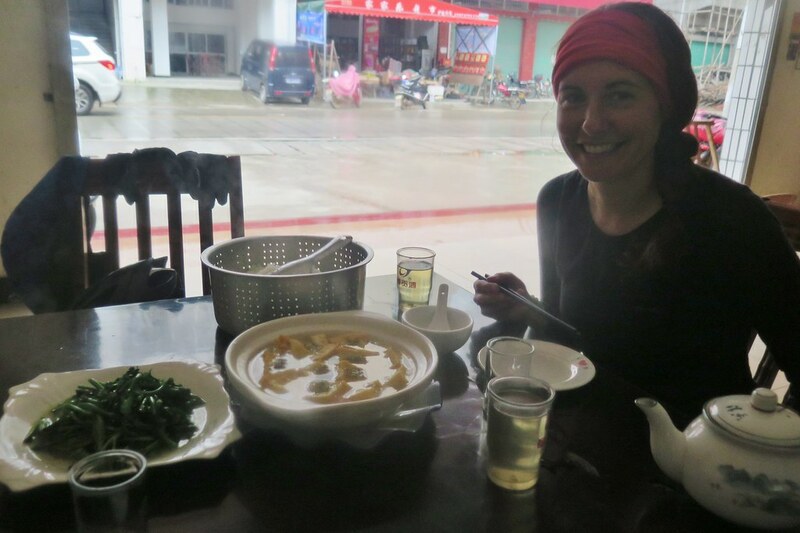 We rode through a deep valley and stopped for lunch after 50km in the first restaurant we’d seen all day. We just went for whatever the owner recommended and ended up with a tofu hotpot dish and some veggies, really nice on quite a cold damp day. We haggled on the price, which seems petty when the price is only a couple of quid but it’s nice to feel we’re only getting slightly overcharged, rather than totally ripped off. It made the atmosphere a little tense while we were waiting for our food getting scowled at. But by the time we left, we were waved off as if we were departing friends, with handshakes and group photos. 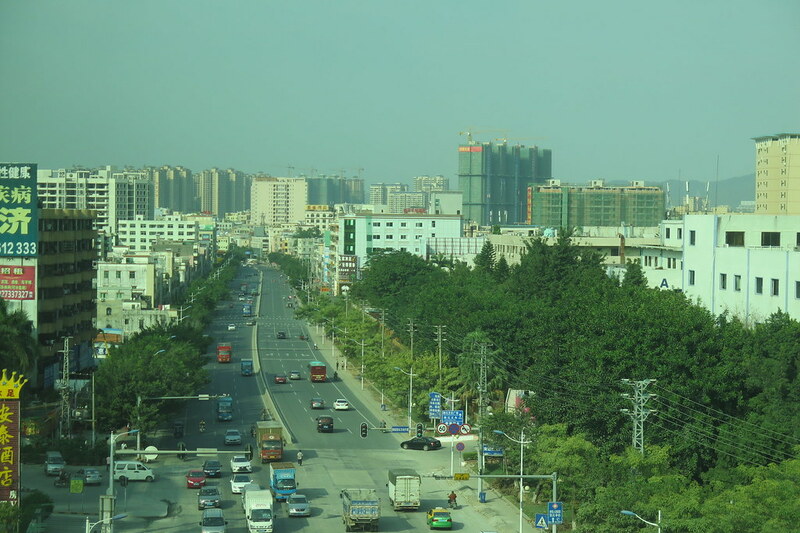 We got through the other side of the mountains in the afternoon and passed through Gangzhou city. Again, we had a load of roadworks and unfinished roads to content with. It made the going pretty slow with the increased city traffic and uneven surface. As with almost everything in China, it’ll be great when it’s finished. The next day, continuing on the G105 we had another really long stretch of unfinished road. We’d reached the top of a climb and were looking forward to the descent on the other side. We got the downhill, but we were riding through deep heavy mud for around 10km. In the middle of the section, a truck had overturned, spilling its load of timber all across the road blocking it completely. Luckily we were able to go around it on the edge of the road, but all the other vehicles were stuck. God knows how long it would’ve taken to clear up the mess and get the truck out, but I think the drivers were in for a long wait. 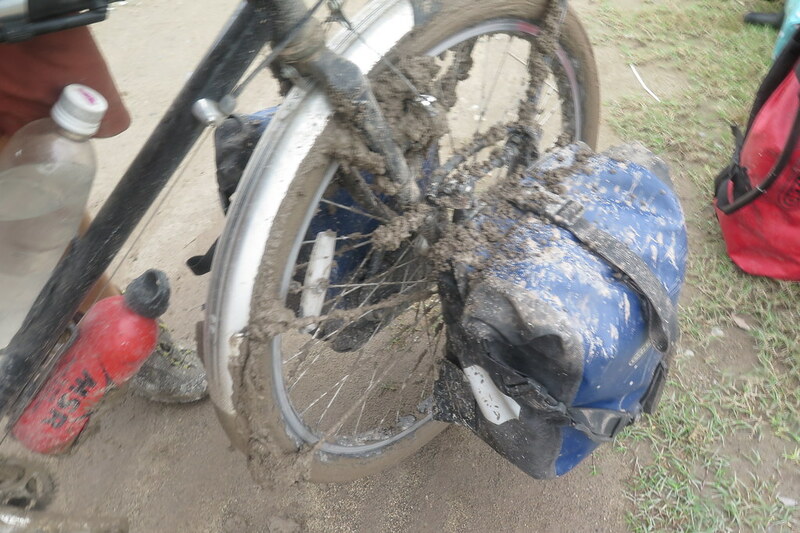 Once we got through and reached the concrete again, our bikes were covered in mud. Our mud guards were clogged up and our brakes and drivetrains caked in heavy wet clay. It made cycling very difficult until we could get to a gas station to use a hose to spray everything off. The rest of the day we were riding with super dry chains and noisy gears until we gave everything a proper clean and oil that evening. We passed 5,000km that afternoon too. The last 1,000km has gone by quickly as we’ve been making quite quick progress on this part of the trip. 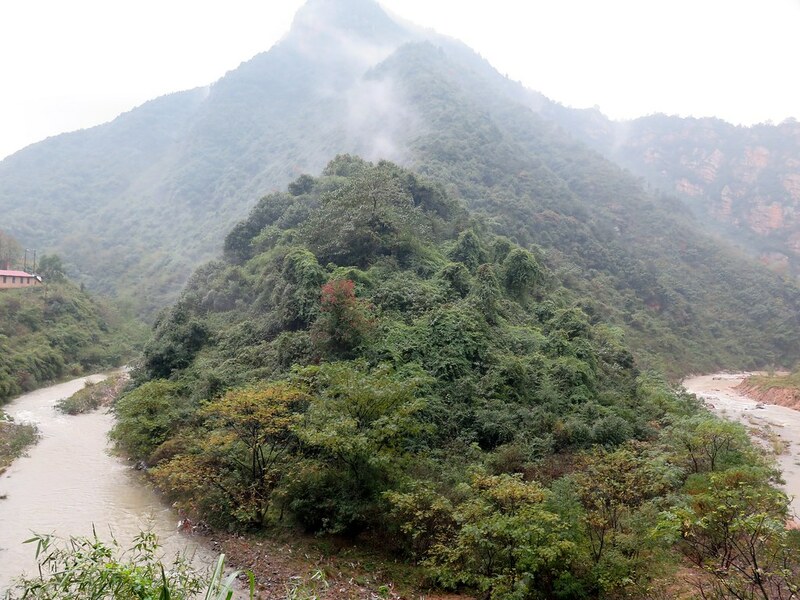 From here on, we left Jiangxi Province and crossed into Guangdong. 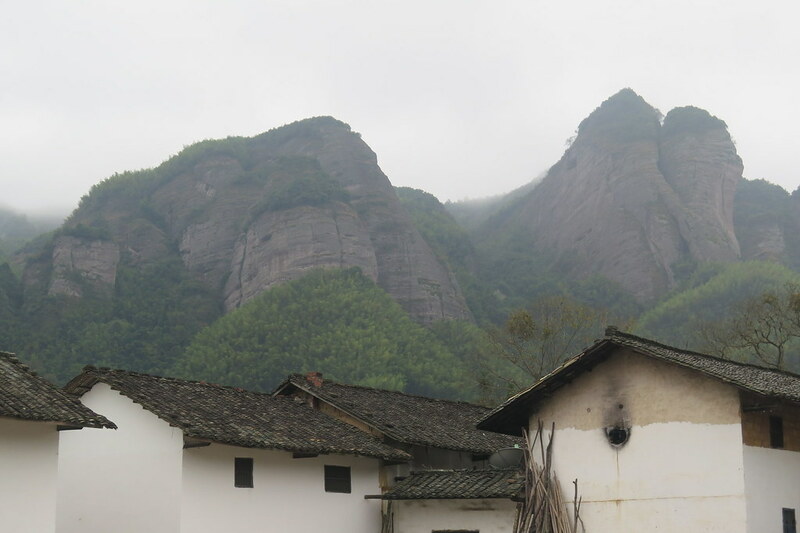 We went over a pass next to Little Wudang Mountain a huge rocky outcrop towering above the road. We had no idea we’d pass it as it wasn’t shown on the map so it was an unexpected visual treat. 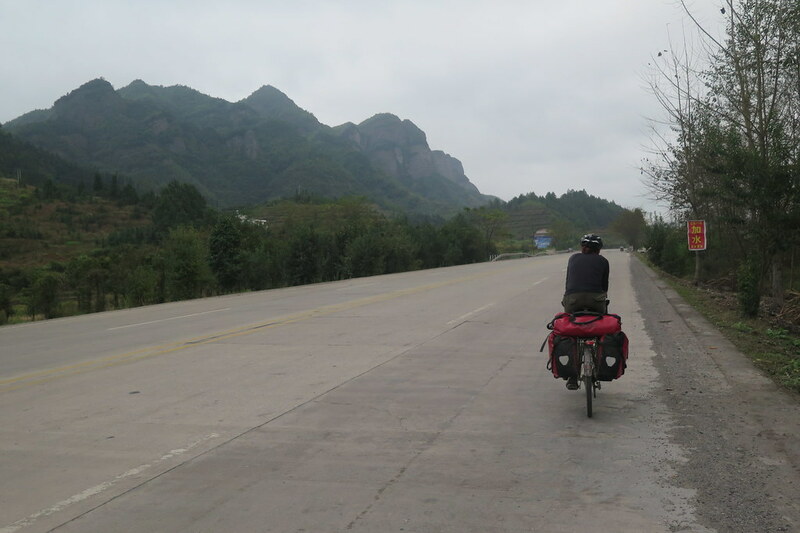 We then had a really nice descent down the other side, coasting into Lianping. Almost immediately, the weather improved and we felt like we had moved into another country. 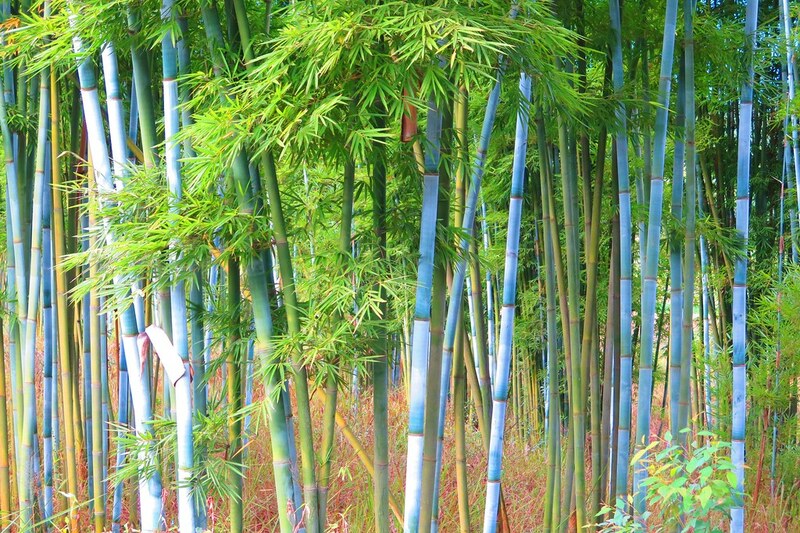 It was a lot warmer and the surroundings seemed a lot more vibrant and colourful. The rain gave way to sunshine, lifting our spirits considerably. The next couple of days were a pleasure, riding in shorts and tshirts again, getting a bit sunburnt and enjoying different, more tropical surroundings. We were still pushing to get the distances done, but had a tailwind from the north, helping us to keep our average speed up. We left the G105 finally to head directly south over another range of mountains on the final stretch to Hong Kong. 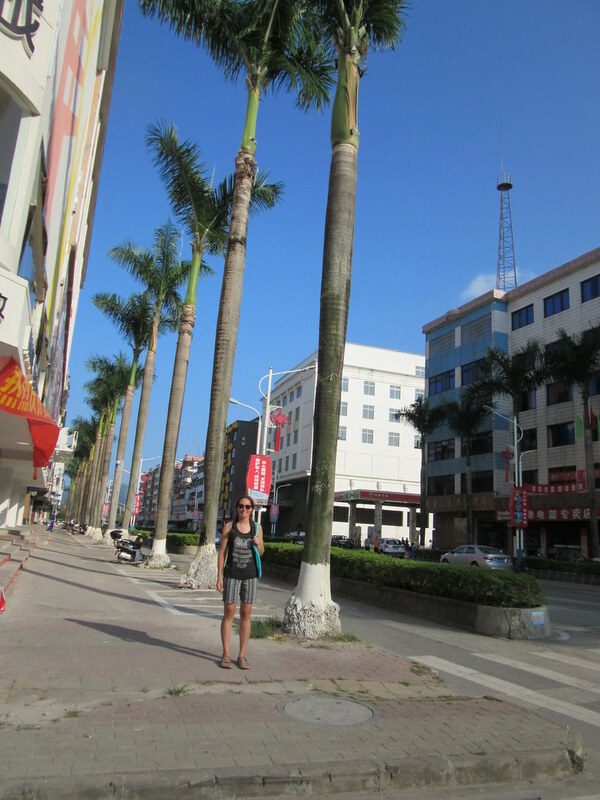 On the day before crossing the border we got to Huizhou, and entered the urban sprawl of Southern Guangdong. This meant a lot of multi-laned roads, and sections where bicycles aren’t permitted. We just ignored a lot of the signs and took the most direct route we could, over busy flyovers and through tunnels. The traffic is chaotic and unruly, but it seems to flow despite the lack of order. 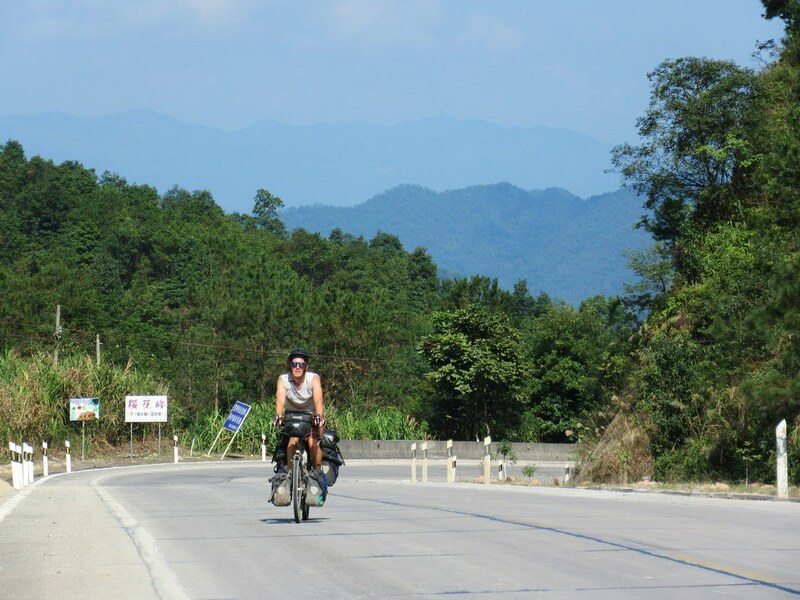 Our last night in China for this leg was on the outskirts of Shenzhen about 65km from the border. We were up at sunrise and on the road by 7:30. The tailwind was still with us so we rode quickly into the city. 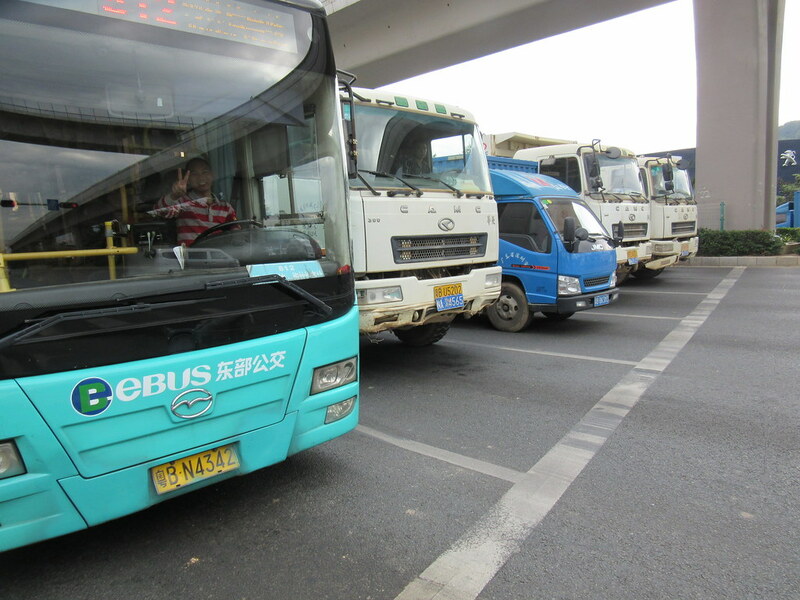 The further into town we got, we had more frequent stops at traffic lights and we were fighting for road space with more and more buses and trucks. Clare had a couple of near misses with a bus and a taxi cutting right infront of her, so it was quite a stressful few hours. 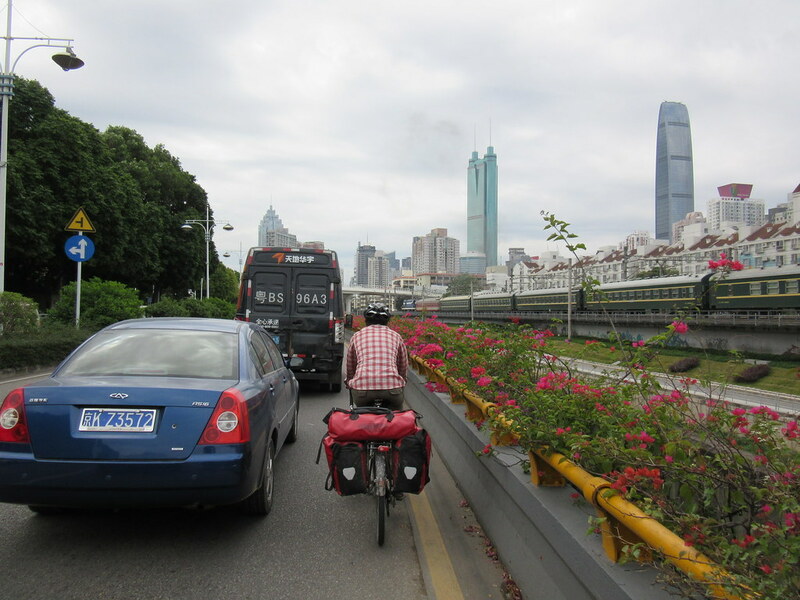 Finally we reached the main Shenzhen railway station and got lucky picking a road right up to the right entrance, allowing us to walk inside with our bikes and join the line for the border crossing straight away. 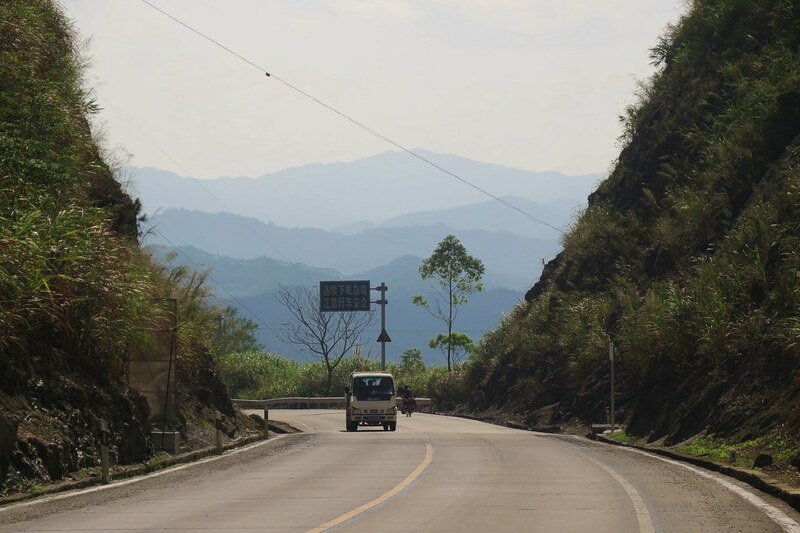 The border crossing was straight forward, even if the process is somewhat convoluted. First we passed through China border control and customs. 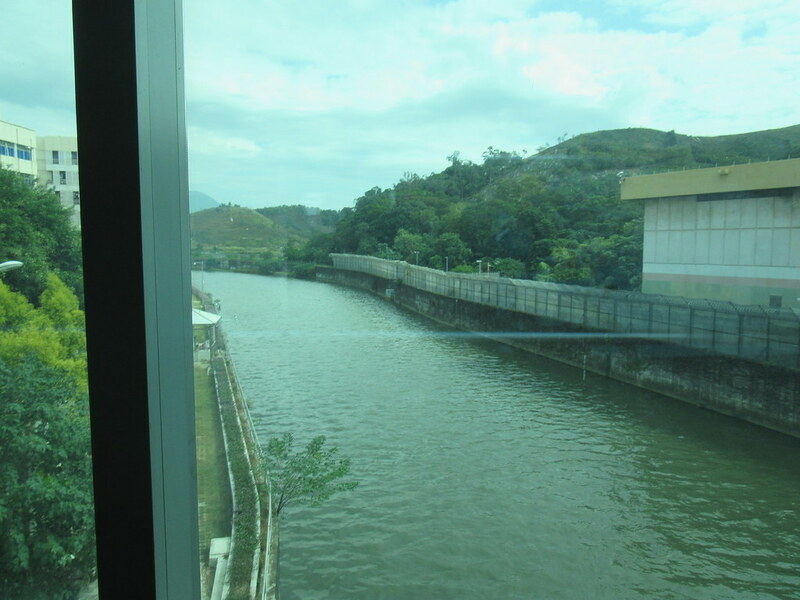 Then follow a walkway, taking us across the river denoting the border with Hong Kong, and pass through Hong Kong passport control. This involved going up and down a flight of stairs, carrying our heavy bikes, always a pain in the arse. 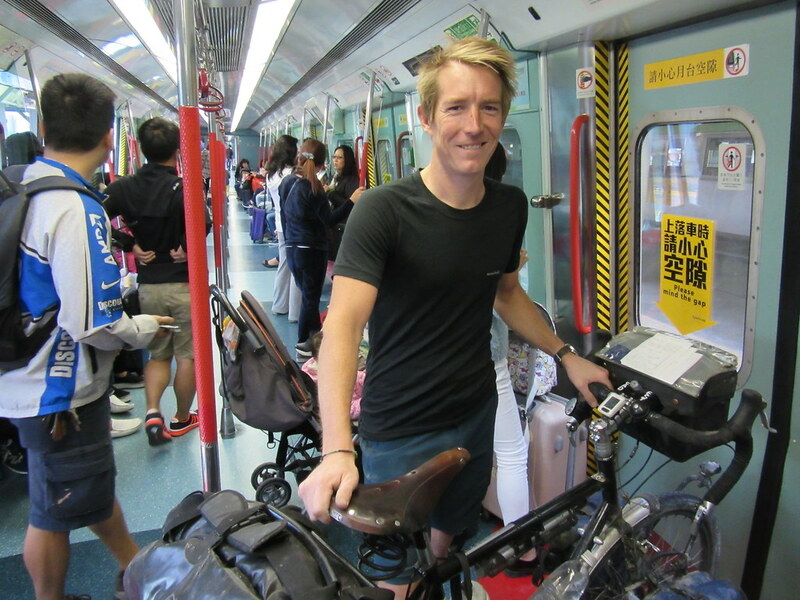 Luckily we were waved through customs without having to take our panniers off to be X-rayed or checked, so could wheel the bikes straight through into Lowu station. From Lowu, everyone has to board a train to cross the ‘no mans land’ and get off at the first stop, Sheung Shui, or continue down through the New Territories to get down to Kowloon. Going through the ticket barriers, we were told to take the front wheels off our bikes. Quite what this achieves, other than to make it much harder to manoeuver the bike, I don’t know. But rules are rules it seems. Being rebels, once we were out of sight of the ticket attendant, we put the wheels back on and continued to the platform and onto the train. We were on the train for all of 5 minutes to get to Sheung Shui, then got off and we had arrived in Hong Kong! Remember to ride on the left! It was quite a big moment for me to get here. 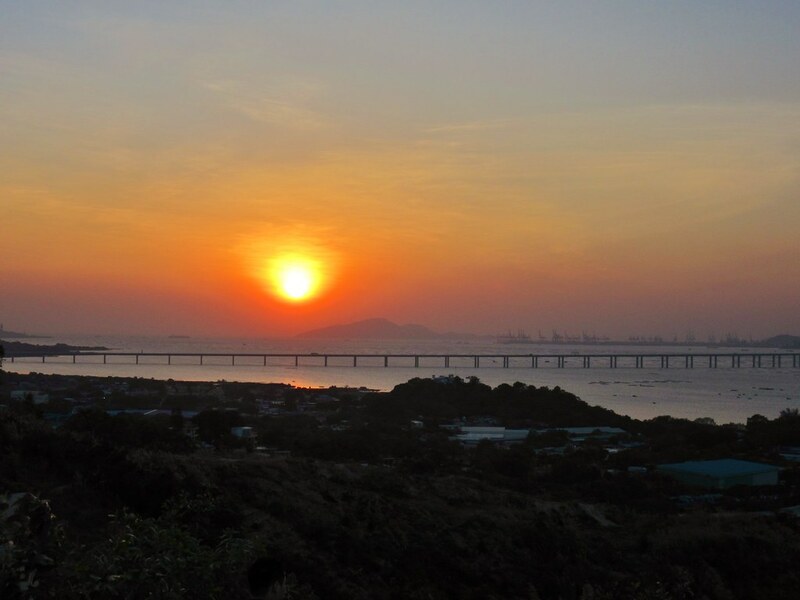 I lived in Hong Kong for 12 years as a kid, growing up in the New Territories, about 10km from Sheung Shui. Despite the many years that have passed since I was last in the area, it still felt very familiar. 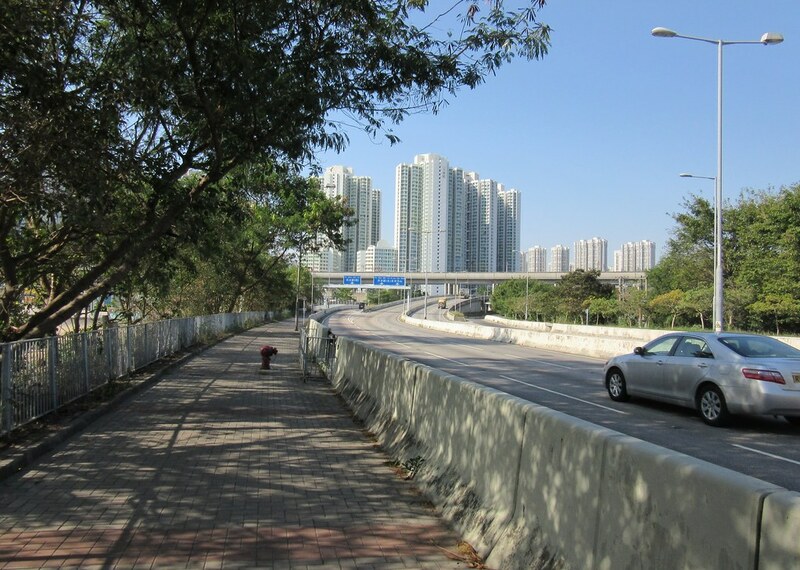 We had about 20km to ride to get to our friends Sam and Shell’s place at Ting Shui Wai. Our route took us along roads I remembered and past signs for places I recognised from my childhood. But that didn’t stop us getting a bit lost. 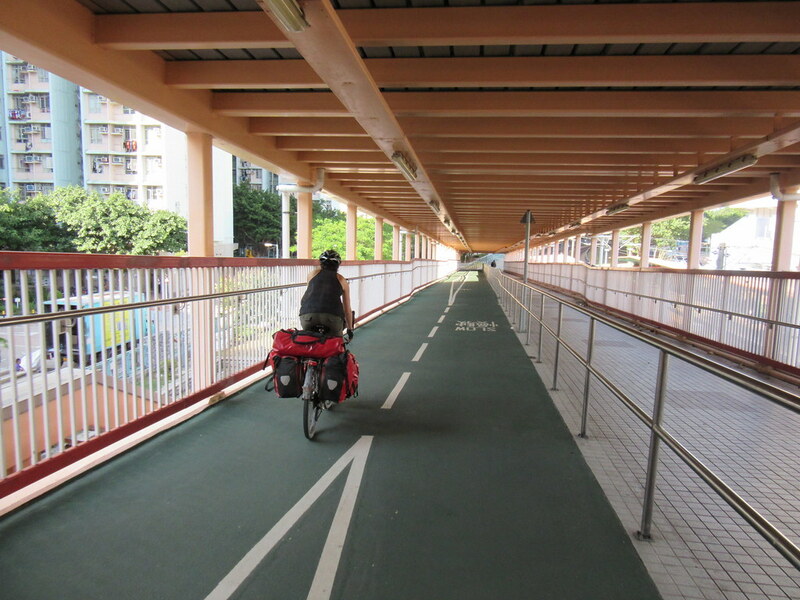 In my defence, a lot has changed – the cycle path system through Yuen Long is quite confusing and Ting Shui Wai barely even existed when I lived here! After a few dead ends and a lot of studying the map, we reached Sam and Shell’s bang on time. Shell welcomed us in and we met their baby girl, Bowie for the first time. Sam got back from work soon after we arrived and we went for a walk up a nearby hill to watch the sunset over Deep Bay. 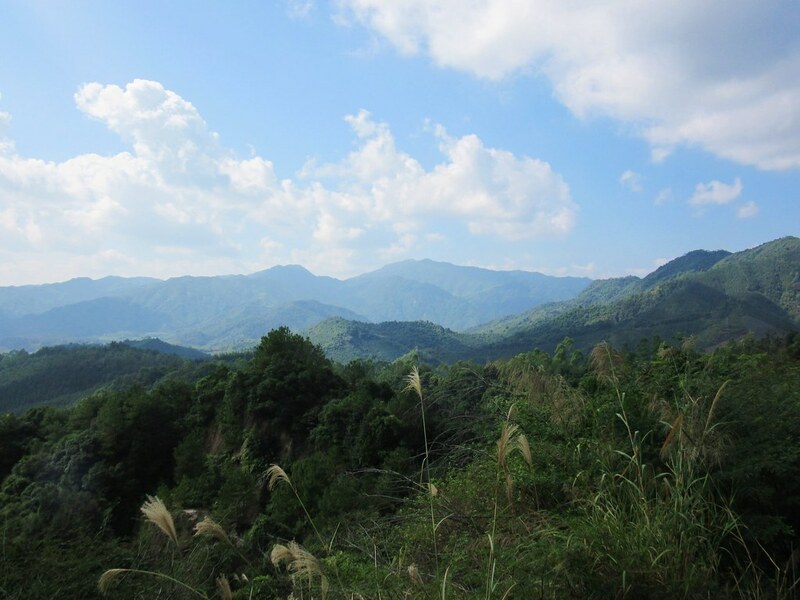 They live in a beautiful little village in a rural part of the New Territories, very different from the famous skyline of downtown Hong Kong. A really nice and peaceful place after the noise of China. We’re planning spend 10 days or so relaxing here, seeing some friends and arranging onward visas for China (again!) and Vietnam. Our first leg in China was 1,973km. 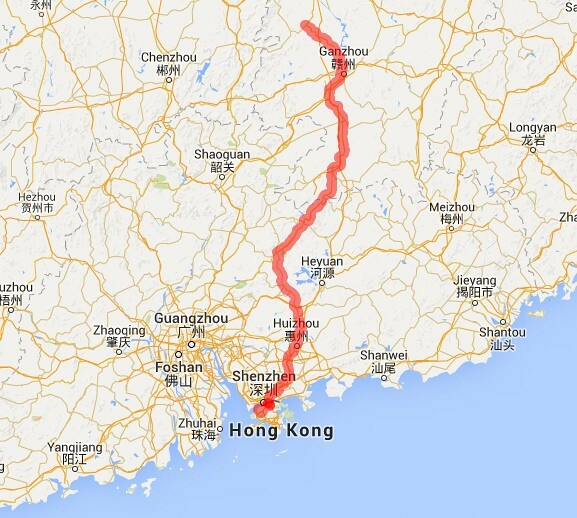 Here’s the map of of our route from Suichuan to Hong Kong.